Tracy Anne Evans (Pate) was born in San Diego, Calif., at Balboa Naval Hospital on Aug. 6, 1960. She slipped through the bonds of earth on Oct. 24, 2011, at her home in Hailey, Idaho. Tracy is survived by her husband, Fred Evans, of Hailey; parents, Clyde and Marilyn Pate, of Green Valley, Ariz.; sister, Kerry Lyn Forrest, (Brian) of Descanso, Calif.; brother, Duncan Pate (Kathleen), of Escondido, Calif.; and her beloved Chihuahuas, Pepe, Chico and Gracie Mae. A large extended family of aunts, uncles, nieces and nephews remember her with love. Tracy went to elementary school in San Diego and in Yokohama, Japan. She is a graduate of Madison High School, San Diego. After training in computers she worked at several businesses in Ketchum. Her career as an administrative assistant began at the San Diego Chabad, then at the Chabad in La Jolla. After moving back to Idaho, she worked for the Blaine County schools where she was adored by the administration, custodians, bus drivers, teachers and kids. 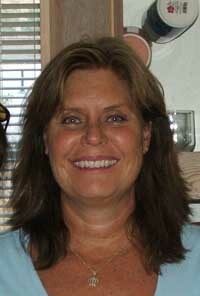 Tracy was a competitive swimmer and surfer girl, and spent many hours with friends and family at San Diego beaches. She started a surfing club and taught teenagers from the Chabad how to skim the waves. She also coached swim teams. If you met Tracy, you loved Tracy, and that showed with the amount of lifelong friends she had. She fought to the very end, never giving up hope that she would beat the breast cancer that invaded her body. She was an inspiration to everyone around her, showing us determination, courage and undying love. There will be a celebration of life on Nov. 5 at Mahoney's Bar, Main Street in Bellevue, Idaho, at 6 p.m. Beach and pink attire is encouraged. Tracy loved music and dancing, and a party in her honor with all her friends and family is what she wanted. Plans are also being made for a surfers' farewell at Tourmaline Beach, San Diego, in mid-November. Her brother, Duncan, will take her remains out on his surfboard and return her to the ocean she loved. Her family and friends hold her in their memories and in their hearts.